A mind once stretched by a new idea, never regains its original dimension. In the early 70's a few European Investors had a great dream about a great country with a great future, Canada. To give their dream some shape, in 1972 they incorporated a property management company in Ontario. Ontim Investments Limited is a privately held company with the purpose to oversee their developments. They started to put their dream to work, by acquiring properties in downtown Toronto for office space. In 1974 they acquired property in Oakville right on the lake and built Sir Richard Towers, a residential apartment building. 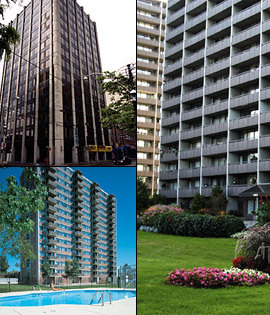 Between 1975 -1977 the group under the management of Ontim expanded into Burlington and built 3 residential towers known as Burlington Towers. In 1976 they moved on to Mississauga and built a condominuim townhouse complex of 61 units. Today, the Ontim team is keeping up with the various new demands in the residential market and established a Hotel Alternative for professionals away from home. More than 50 corporate suites, all professionally decorated and furnished in their Burlington Towers Property, make it easy for our guests to call Burlington Towers home. Ontim has a great, professional maintenance crew who proudly ensures that our properties are clean and well maintained to keep all our residents and commercial tenants fully satisfied for over twenty-five years.